Paying only $1.36 at Tulsa Gas Technologies and $1.25 at the ONG stations for fuel. 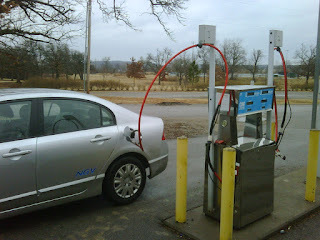 The Chickasaw nation just opened a CNG station in Ada, OK. I don't get to Ada very often... I'm still waiting on a station to open in Durant, OK or Paris, TX so I can easily make a trip to Dallas without going down I-35. Also, been tracking Castlen Kennedy's trip with a dedicated CNG Tahoe. She just almost ran out of fuel between Baton Rouge and Florida due to a 3 hour delay in Baton Rouge traffic. 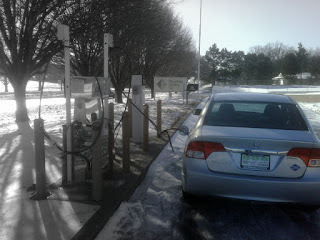 This sure highlights the need for more fueling stations. Also, once Castlen arrived at the station in Milton, FL it was closed... that's strange because all the stations I fuel at in Oklahoma are unmanned and open 24/7. I never have a problem getting fuel all hours of the day. Sufficient fueling locations - starting with my garage for the Leaf. 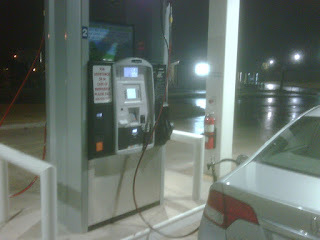 The CNG fueling option for the Civic is still unavailable. Battery viability? Not sure - but I'll be finding out! More on that in a minute. So, almost all of the reasons (except for #5) that I purchased a CNG vehicle apply to a electric vehicle. It's cheaper, easier to fuel, & doesn't use foreign supplied fuel. Now, battery viability - Nissan states that the Leaf should travel 100 miles on one charge and that the batteries should last 5 to 10 years. That's a bit of variability in the life expectancy... I would tend to favor a CNG tank over a battery except for one thing - our society will adopt batteries much quicker than a CNG tank. 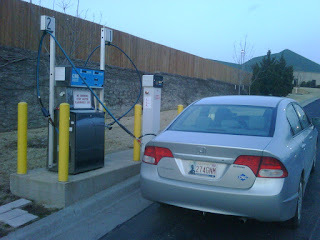 Recharging a car battery gives the owner the illusion that their daily commute is emission-free. My primary conviction is that the US is going broke due to the massive quantities of energy source imports. Any viable technology that enables use of domestic energy for transportation purposes should be pursued. 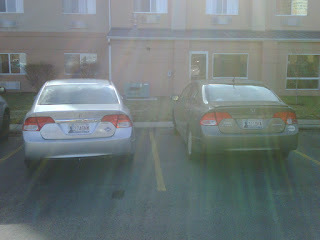 So, I am hedging - I will have an electric powered vehicle and a natural gas powered one as well. But neither will require crude oil derivatives. Some folks have asked about the effect of ambient temperature on CNG. Natural gas (or any gas) when confined in a fixed space will increase in pressure as the ambient temperature rises or decrease in pressure as the temperature falls. This is true for natural gas in a vehicle's storage tank as well as the air in the vehicle's tires. The magnitude of the change in pressure is a function of the size of temperature change, starting pressure, and the gas composition. 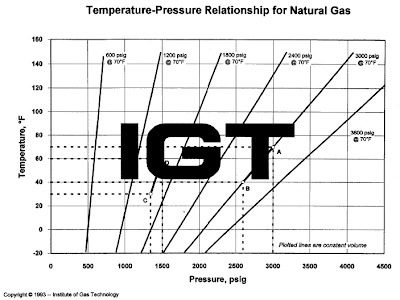 Since the term "natural gas" represents a broad range of gas compositions as distributed in the US, IGT used a mean natural gas composition. The temperature-pressure relationship figure presented (below) can be used to determine the change in pressure corresponding to a change in temperature for natural gas. Six reference lines have been plotted corresponding to six different starting gas pressures at 70 deg F. As an example, point A represents natural gas in a storage container at 3,000 psig and 70 deg F. Should the gas temperature drop to 40 deg F, one can expect the gas pressure in the tank to drop to 2,596 psig (point B)... It is important to note that the change in pressure does not represent a change in the amount of gas (energy) within the tank. The gas simply contracted or expanded as a result of the change in temperature. This source document and others like it can be viewed in The File Library of cngchat.com.